Prepaid Netbooks, Make Your Own! Prepaid Netbooks - Do They Exist? Prepaid Netbooks - Why sign a contract?! For the same reasons I discuss in the Prepaid Wireless Internet and Why Prepaid Wireless sections, I don't like the idea of signing a contract to get a prepaid netbook and mobile broadband bundle. Those offerings may meet your needs, and if they do, that's great. But for those who want the flexibility to pay only for the service you use, to control your spending, as well as for those who enjoy the freedom of changing carriers to get the best service, the thought of signing a contract will probably make you somewhat sick to your stomach. Unfortunately, I'm sorry to say, that there isn't good news related to integrated prepaid netbooks. The fact is that prepaid netbooks don't currently exist! Ouch! The reality is that prepaid wireless carriers are still getting their feet (and business models working) around offering Prepaid Wireless Broadband Plans. There's still a challenge with how much they should charge for prepaid mobile broadband access, and how much people are willing to pay to buy the initial broadband card, USB modem, or WiFi Hotspot. Because they don't have you sign a contract and can't know how long you'll stick around with their service, they can only subsidize the equipment so much (if at all). You'll find that the prepaid industry is still experimenting with prepaid mobile broadband, and some players have already gone under. A prepaid netbook offering really isn't a far stretch from offering prepaid broadband via broadband modems. The price of the hardware might be somewhat higher for prepaid netbooks than for broadband cards and modems, but the plans would likely look similar. I really do believe that it's only a matter of time before we see this type of offering from prepaid carriers, however, don't expect it to come anytime soon! Carriers will also have to invest in more complex operations and customer support that really would be incremental costs to their current business operations. Consider that netbooks are far more complex than phones or broadband cards, because now they have to worry about troubleshooting operating systems like Windows, software that people install that can cause problems with broadband modem drivers or Internet connectivity, etc. That's not to say that it can't be done, but I don't expect that it will be on the top of any prepaid wireless company's priority list. It's definitely not time to give up though! Can you have a super cool, super small netbook AND prepaid broadband? Absolutely, yes! How? Although it's not going to be as pretty as a solution where the broadband card is integrated into the netbook, you can still access prepaid broadband services using a netbook. 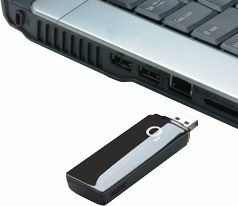 Simply get yourself a prepaid mobile broadband USB modem and plug it into your netbook, or connect via WiFi using a mobile hotspot, and you're good to go! I don't believe most netbooks come with PC Card slots, so you'll want to make sure that you buy a USB modem that you can plug into the side or back of the netbook. We may even see some netbooks surface with Express slots (smaller PC Card slots) in the future. In my opinion, that would be great, as I'm personally not a fan of USB modems because of the risk of them snapping off as you move around, which you'll definitely be doing with a netbook! But it seems that most people around me are buying USB modems, so please don't let my opinion turn you off. You can also look at a Mi-Fi option to connect your netbook via Wi-Fi to a mobile broadband access point. 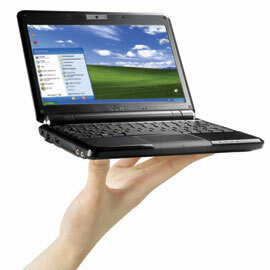 Netbook Reviews - Can Netbooks Survive? It's safe to make the conclusion that although truly integrated prepaid netbooks aren't currently available, you can piece together your own solution. Simply buy a prepaid broadband modem and service and connect it via USB or MiFi to your super small, inexpensive, and super cool netbook; done! And although you'll pay more for your netbook, you'll have the freedom to move to any wireless carrier you want, and you only have to pay for the data you use. Think about when you're sitting next to your friend who got a netbook bundle from their postpaid wireless provider and they're not getting reception. You can humbly smile at them and quietly laugh inside when you think about the fact that they'll have to buy a completely new netbook if they switch carriers; not to mention the early termination fees that they'll have to pay. In other words, they'll be suffering with their service until their contract is over while you enjoy your prepaid netbook. All that said, will you go the netbook route, or the tablet route? !